Jun 18, 2013 Are you going to roast a turkey but you are not sure that you know how to do it properly? Our step-by-step tutorial will help you to cook a delicious dish. It is a very simple and understandable guide. Of course, there are different opinions on how to cook a turkey in the best way. Many housewives have their own recipes and they keep them secret. But we have taken a basic approach, which can be considered as a template. You can always add some personal touches to it. This recipe suits for any turkey, regardless of its size, breed or condition. Maybe you will have to vary the cooking time, but you do not need to change the fundamental technique. First of all, if the turkey is frozen you have to let it thaw. You can do it by placing the turkey in the fridge but in that case it will take a couple of days to completely thaw it. 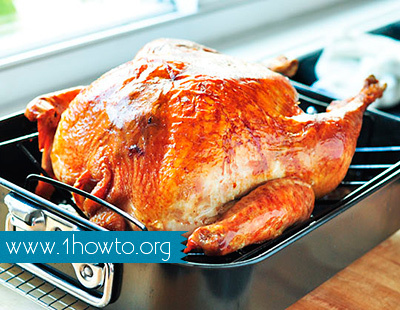 If you want to do it quicker, place the turkey in cold water and replace the water once in half an hour. Many people prefer to brine1 the turkey before roasting. 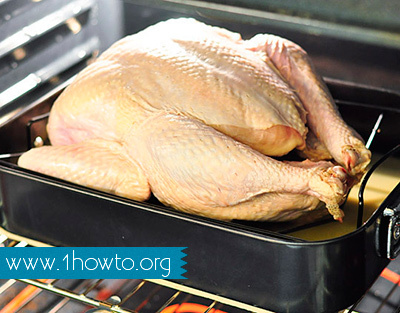 This method means immersing your turkey in a special salty solution for some hours or even days. It makes meat moist and seasoned. We are not going to explain here how to brine the turkey but you can take it into consideration. Now that you have everything required, you can start roasting the turkey. Prepare your turkey for cooking - About one-two hours before placing the turkey into the oven, take it out of the refrigerator and remove the packaging. Do not forget to look into its cavity. Then lay it breast up on the rack. The meat will become warmer which will help it to cook more evenly and much faster. Heat your oven to about 400 degrees Fahrenheit - The rack should be positioned one third from the bottom of the oven. A brined turkey is ready for roasting. But if you have just taken it out of its package, you should rub the turkey with salt, pepper and any other spices. 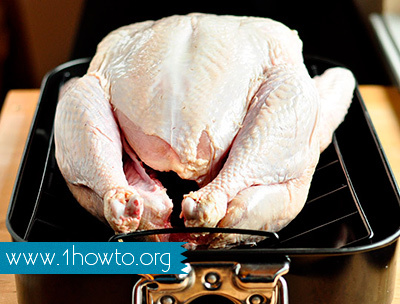 If you are cooking a turkey for the first time, you should not truss or stuff it. The meat will have a brown skin and rich flavor if you rub it with oil or butter. You can also place garlic and halved lemons inside its cavity. 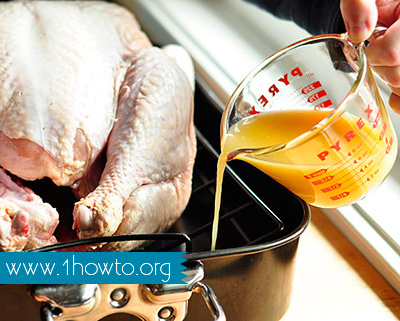 Start roasting the turkey - First, pour a couple of cups of water or broth into the pan. Then put the turkey breast up into your oven. The heat should be turned down to about 300-350 degrees Fahrenheit. 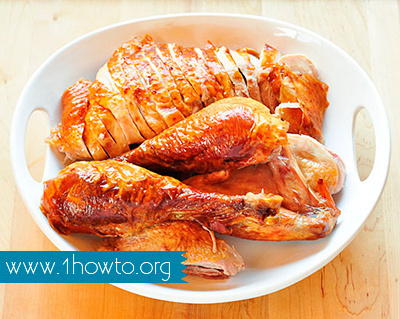 Set the cooking time - One pound of a turkey requires about twelve minutes of roasting. So, if you have a 15-pound carcass, you will have to cook it for about three hours. Nevertheless, if you have brined the turkey, have left its legs un-trussed or have not stuffed the cavity, the bird can cook faster. It means that you have to start checking it after an hour and a half of roasting. Baste it - Every half an hour (or forty five minutes) take the turkey out of the oven and baste it all over. It cools its surface, slows down the process of roasting and helps to cook evenly. Use pan juices along with oil or melted butter for it. Rest the bird - Tilt your turkey for liquids in its cavity to run out. You can use them for making delicious gravy. Then transfer the turkey to the cutting board. 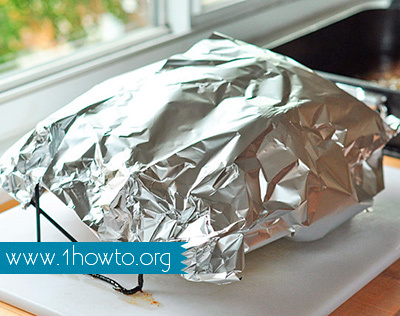 Tent the carcass with some foil and leave it there for about half an hour. It will make the meat juicier and easier to carve. Time to carve - Now you can carve the bird like you slice a chicken. First, remove its wings, then cut off the thighs and go on to the breast. After you take off the meat, you can separate drumsticks and carve all the pieces into slices. That's it! Invite your guests to the table, enjoy your tasty meal and listen to numerous compliments about your cooking skills!